I manage this condo for the delightful owners. I have been a Maui resident for more than 19 years. I enjoy helping people find accommodations on Maui that fit their needs and providing information about what to do and see while on their vacation. I offer personal service and attention to all my guests during the reservation process and during their stay. Personal attention is one of the many assets that make this vacation rental unique. The condo is lovely, well maintained, nicely furnished and the ocean views are incredible. You will love it here. Please feel free to call me if you have any questions. This is a lovely second floor unit that sits right on the rocky shore. The location affords great ocean views facing north, south and west and because it is a corner unit it offers panoramic views from the great room/dining area and kitchen. The ocean can be seen from every room except the guest bathroom and guest bedroom that overlooks lush tropical gardens. The Master bedroom has its own private ocean front lanai (balcony) with incredible ocean views, a King bed and a private bathroom with double sinks and shower heads. The Guest bedroom has two twin beds that can be converted to make a King. The condo is fully equipped and includes beach towels, beach chairs and a beach umbrella for your use. Unit was extensively renovated in 2014 (bathrooms and bedrooms) and in 2016 [brand new tile (from the hallway to the great room). The kitchen cabinets were redone (white), brand new stove/oven and new dishwasher. There is a new light green/glass back splash. There are new (Fleetwood) pocket doors (to the lanai), and new (matching) tile in the lanai.] These top notch renovations have made this unit an even more impressive place to see and stay! 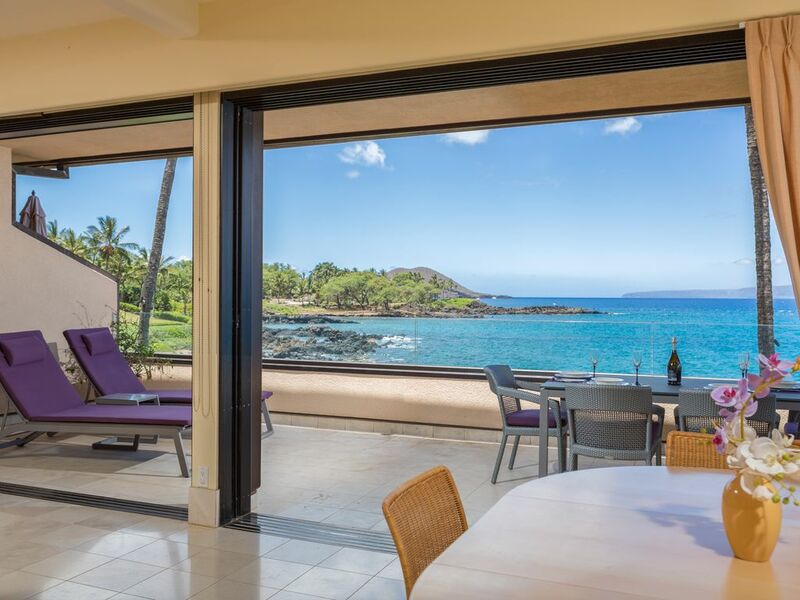 Makena Surf is a premium oceanfront condominium resort that offers quiet and seclusion, and a full range of amenities including 2 outdoor pools, 2 outdoor hot tubs, 4 tennis courts, off street parking, 24 hour security, gated entrances, outdoor BBQ terraces, and herb gardens. The lush tropical landscaping complements its location nestled between two secluded beaches. The beaches are a short walk down a lovely paved path. You have the choice of ½ mile long Po'olenalena beach on the north side of the resort or Chang's beach on the south which is smaller and more secluded. Both offer great swimming, snorkeling, diving, paddle boarding and when we get a south swell, surfing. There are showers next to both beaches so you can rinse off after a refreshing dip in the sea. The master bathroom is private and has two sinks, double shower heads, a bidet and an ocean view. You can see Chang's beach from the great room, dining room and main lanai (deck). It's about a 1 minute walk. Makena Surf sits right on the shore between two white sand beaches both of which are great for swimming, snorkeling, kayaking and diving. Watch the turtles, dolphins and humpback whales from almost every room in this condo, even the master bathroom has a view! This corner unit sits at the edge of the rocky shore and is surrounded by unsurpassed panoramic views of the ocean. It is on the second story so offers a great vantage point. Enjoy your coffee on the lanai with the early morning sun shining on the islands of Molikini, Kahoolawe & Lanai. (3) Telephone with message recorder in kitchen. Both bedrooms have phones. Central air and ceiling fans. Extra sets of linens and beach towels provided. Please see photos of the new fitness center, established in 2018! Private wireless network. A wireless printer is also available. Opens to dining room and kitchen and has expansive ocean views. New stove and oven (installed in 2016). The well stocked kitchen has everything you should need to prepare your meals at home. Beautiful granite counter tops and cabinets grace the contemporary appliances and ocean views from every window. The ocean views from the dining area are amazing. The sliding doors recess into the walls allowing for an expansive view of the sea right from your table. New 55' HD flat screen TV with Blue Ray Player in living room. Flat screen TV's in both bedrooms. Guest room also has a DVD player. All TVs have remotes. Cable TV in living room and both bedrooms. CD player in living/dining room. Blue Ray DVD player in great room. DVD player in Guest bedroom. Large selection of novels and books about the island. 4 onsite courses, some lighted. Free for guests. The club houses for Wailea Gold, Blue & Emerald and the Makena course are all within 2 miles of the resort. (2) Two outdoor pools on site. Housekeeping service included every 7 days for stays of 14 nights or more. Personal safe in master suite. Private gated community, 24 hour security, 4 free tennis courts - 2 lighted, lush grounds with public herb gardens. We loved our unit and plan on coming back. The grounds are beautiful and well kept. The beaches are great! Breathtaking View ! Amazing location! What an amazing vacation we had ! The lanai overlooks “turtle town”. We literally went right out to the small beach and swam with large green sea turtles ! Walk the other way and we were on one of the best beaches in the area. The unit is newly renovated with all amenities. BBQ is available in the common area as well as a garden of fresh herbs. We will be back ! Amazing views. Best snorkeling on Maui steps away from the condo. Modern, spacious, overall a lovely experience. Only negative no BBQ. Recommend highly for family of 4, pricey but you definitely get what you pay for. This was a first class stay in one of the best locations in all of Hawaii. The apartment is flawlessly clean, with hardwood floors and modern, updated furniture. The main beach next to the complex is private, expansive, and beautiful. Turtles always right in front of the balcony. By far our best stay in Hawaii. This was a dream vacation! This property is amazing. The condo has been renovated since the posted photos were taken, it is even more beautiful than the photos depict. This unit is an ultra-modern beauty. Is is open, spacious, light and airy. The kitchen is VERY well equipped with more cookware and dishes than anyone could possible use. The appliances are brand new. The furniture is very comfortable...including the beds. The a/c works well, just make sure to close the master bedroom blinds and turn on the ceiling fan to keep the master suite cool. If you don't, the afternoon sun will heat up the master suite. The view from the two lanais is truely a million dollar view. Breathtaking. It was wonderful to eat every meal on the lanai while watching the waves roll in. Watching the snorkel tours every day tells you that this one fantastic location. We snorkeled with turtles every day at both the big beach as well as Chang's beach. The reefs are teeming with life (watch out for the urchins) and the water is very safe and snorkel friendly. Last words, property manager Maria is phenomenal. She took care of everything for us. We didn't have any problems at all. She answered every question I had including the best place to watch fireworks on Independence Day. I can't say enough good about Makena Surf F-204 and property manager Maria! We will be back, hopefully sooner than later! Thank you!!! Makena Surf is centrally located on the island making it a perfect place from which to venture out and see all that Maui has to offer. It also has much to offer without even leaving the resort. The snorkeling, swimming, boogie boarding, paddle boarding and diving right off shore are some of the best in Hawaii. There are on-sight lighted tennis courts and two pools with outdoor spas by each. Within a short drive are some of the best white sand beaches on the island. You can visit a different one every day of your stay. Go golfing at the world renowned Wailea Gold, Blue & Emerald and Makena courses or go shopping or dining at The Shops at Wailea, are all within 2 miles. Learn to scuba dive, snorkel, or surf nearby or take a Blue Water Raft trip to the island of Molikini and the sea caves. Go on a whale watching adventure where you are guaranteed to see whales. Heck, you can even see them from your private lanai at F204 along with dolphins and sea turtles. Experience the beauty of a volcanic mountain top at Haleakala. Hike through layers of colorful lava rock, and encounter native Hawaiian species found nowhere else in the world. Watch the sunrise at 10,000 feet and see the tops of Mauna Kea and Mauna Loa on the big island of Hawaii. Drive the two lane road to Hana to see the north shore and the magic of the windward side of Maui. Visit Maui Ocean Center. The 2,000 awe-inspiring fishes, sharks, corals, and various sea-life are breathtaking. Don’t miss the interactive whale discovery center. Flight seeing excursions are available by helicopter to Hana and the Haleakala Crater or do the circle island tours. Go on a private kayak tour that includes whale watching, snorkeling, bottom fishing and distance paddling. They leave out of Wailea - a mile from Makena Surf. Go hiking in the Iao Valley or on the lava beds at LaPerouse. Go zip lining for thrills and a unique way to see hidden parts of the island. Spend the day at Lahaina, the historic whaling village rich in history and art. Maui has a broad range of activities and adventures all within a comfortable drive from Makena Surf resort. There is something for everyone on Maui and people usually leave the island with only one regret – that they didn’t get to stay longer. GE-051-042-5088-01 TA-051-042-5088-01 CURRENT Standard Rates apply from: April 16, 2018 to December 14, 2018! * 14 to 20 nights: $20.00 discount per night plus 2-hour complimentary cleaning every 7 days!! ** * 21 nights or more: $40.00 discount per night plus 2-hour complimentary cleaning every 7 days!! ** * Rates are (annually) revised before April 15! * Existing rates are honored until changes are made on this site! **** CANCELLATION POLICY ***** Cancellation is required 60 days or more prior to your arrival date for a full refund of monies paid less a $200 cancellation fee. For cancellations received within 60 days of or after your arrival date, you may receive a refund upon canceling only if the same dates are re-reserved by another party at the same rate minus a $200 cancellation fee. If the condo is re-rented during this reservation period at a reduced rate or for less time, a pro-rated refund will be issued less a $200 cancellation fee. I do make every effort to re-rent the condo in order to minimize any losses to my clients.